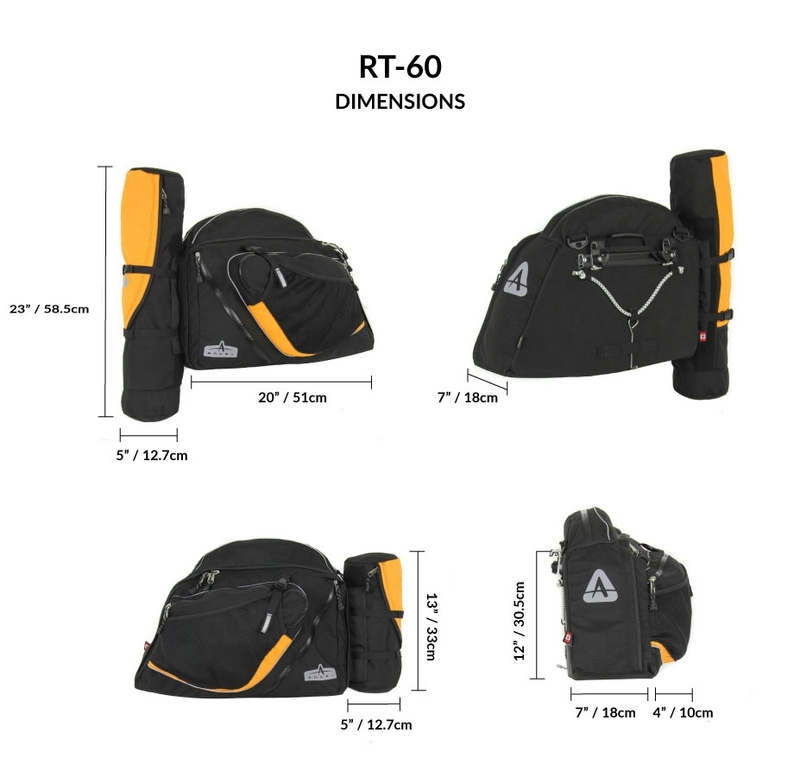 The only truly versatile panniers specifically designed for recumbents. At last a truly recumbent-specific set of panniers. The horizontal design takes full advantage of the space available on a recumbent with a forward slant to cradle the shape of the back of the seat. These panniers are not as high as others since many recumbents use smaller size wheels - ground clearance will never be a problem. These panniers are definitively big enough for touring yet the removable pockets also mean that you can use them for everyday commuting without too much bulk. Check all the features of these panniers - it's a refreshing break for recumbent owners tired of settling for a compromise. Really neat! Add another layer of waterproof protection, increase visibility, keep grime off your bags with an Arkel rain cover. On both panniers the rear tube pockets (the big and small ones) are removable for when they are not needed. The same system allows you to adjust the pockets height-wise if you need more ground clearance for your 'bent. To remove a pocket simply unbuckle the compression straps (top and bottom), lift the velcro® strips and pull away. Re-buckle the straps and voilà!, super sleek panniers! 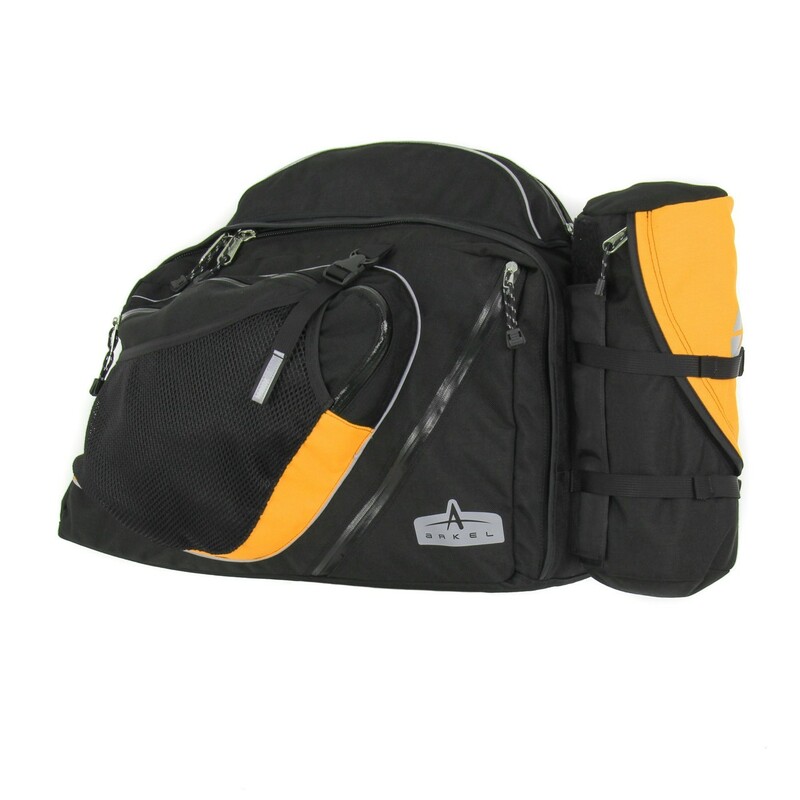 The left hand side panniers features a smaller tube pocket perfect for a large water bottle, shoes, or anything else. But should you want you can also remove it and leave it home. It makes for very streamline panniers! A mesh panel is one of the most useful thing on a pair of panniers. It allows to stash a dripping wet rain jacket, insert a wet towel to dry, or have access to cookies in a jiffy! To make sure that none of those things will jump out on their own, we installed a compression strap that closes at the top. Once you insert something in the mesh panel you can close and cinch tight the webbing, thus holding the content like in a vise-grip (well, okay, let's say like in a fabric corset!!!). The zippers are the best on the market: YKK waterproof zippers with nickel die cast heads. We keep the full metal head so they can be pad-locked together if needed, and we added easy to grab pull-cord for ease of use with gloves. 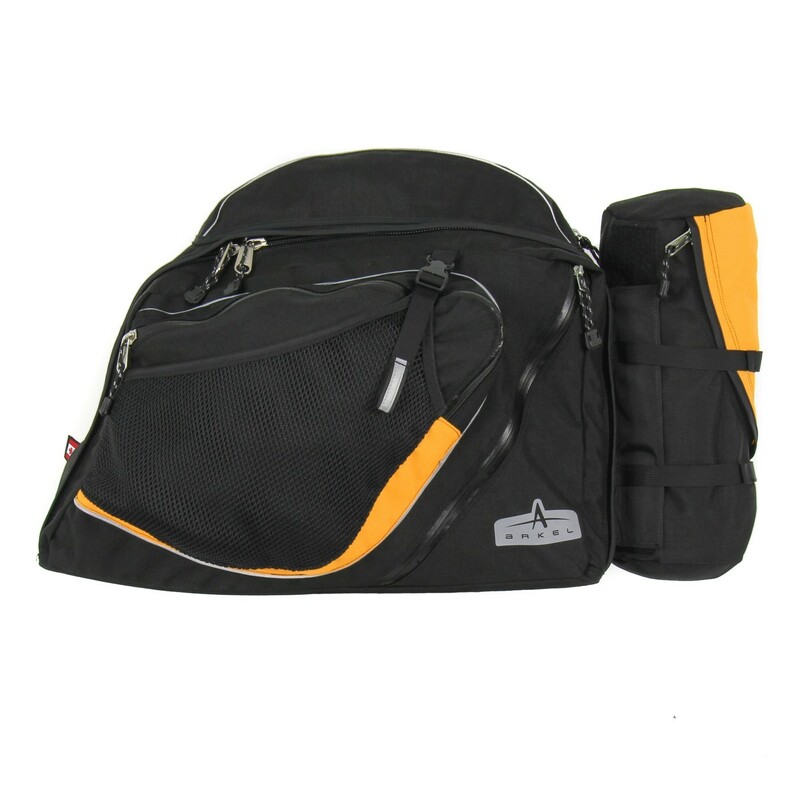 The full head allows to operate the zippers more smoothly, making them that much more durable. 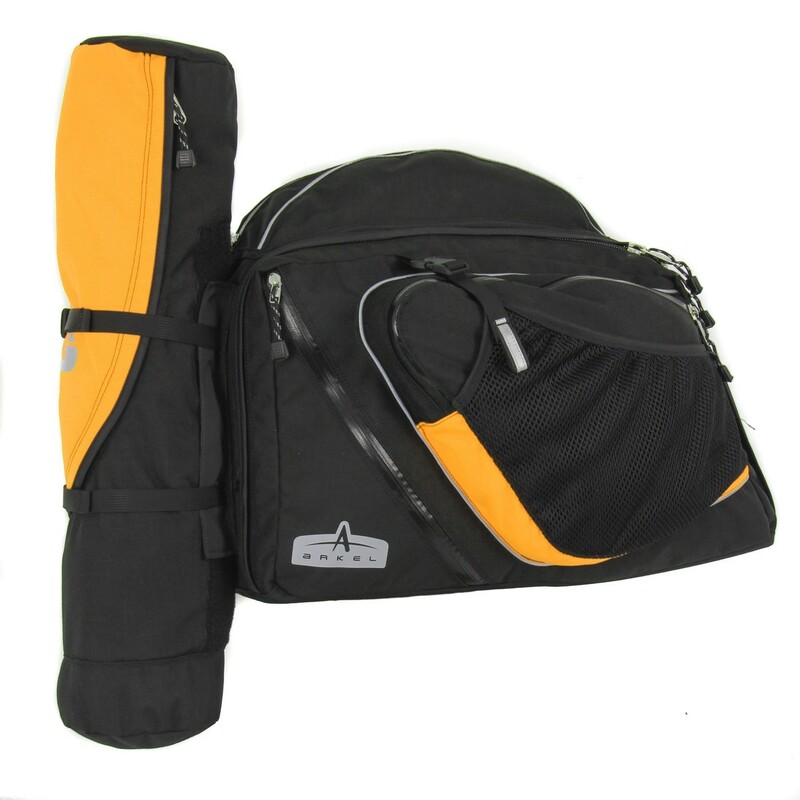 We created a nice, very spacious front pocket for all those things that take space but you don't want to lose with the rest of the pannier content. The zipper curves smoothly, making the pocket very easy to use even with one hand. The main zippers are monstrous #10 created by YKK. These are the biggest, meanest industrial zippers that exist. To make them even more durable we covered them with a rain / dust / abrasion resistant flap. The flap has 5 layers of fabric to be sure it won't thin out and expose the zippers. We don't know of anyone else doing that. In case you didn't notice, the zipper pulls are reflective as well - neat for finding the zipper head at night with a flashlight. Also, as previously mentioned, the full metal zipper heads allow to lock the zippers by using a small padlock and joining both heads together. Every single panel of the RT-60 has been lined inside with a luscious nylon, which means that we had access to a few small nooks to create handy storage. That triangular pocket is great for a wallet or keys. Of course the keys could be in the top pocket, but we wouldn't want to scratch expensive sunglasses! Probably the pocket that you'll use the most frequently, the top pocket is not only easy to get to it's also designed brilliantly. Look at it and you'll notice that it has a wall of fabric all the way around, meaning that even if the pocket stays open by mistake, chances are that you won't lose what's inside! Many years ago we introduce our TFL® (Total Front Loading) zipper design. Simply said, it means that our zippers always go all the way to the bottom for the ultimate access. It may sound stupid said like that, but just try to find somebody else building panniers that way... BTW, the bottom of the RT-60 is a hard shelf - those panniers will not sag, oh no! There's a "hidden compartment" at the back of the panniers. It gives access to the hardware holding the reinforcing backplate and the hook system, but also you can use it to store flat documents or hide valuables. The RT's are fairly big bags with an elongated shape. 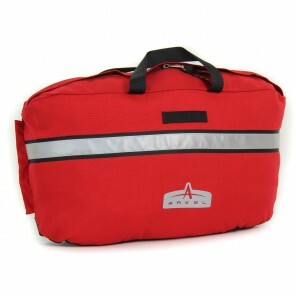 A removable aluminum frame is installed as shown so that the top of the bag with the pocket will not sag down in the main compartment and the proper shape of the bag will be maintained in all conditions. 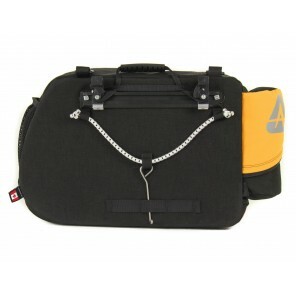 Moreover, the aluminum frame ensures that operation of the main zippers will be nice and easy, no matter the load. And the frame folds flat when you want to store the panniers. The bottom of the RT's has a separate rigid HMWPE shelf, the same material as the backplate. 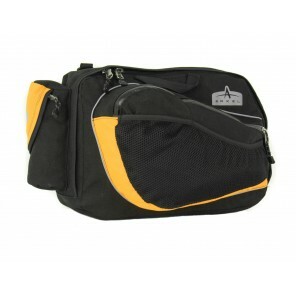 It prevents any sagging of the bottom of the bag so that the whole bag keeps its shape in all riding conditions. The bottom shelf can be folded up when storing the RT's. The RT's have a huge main compartment. In addition to the aluminum frame and in order to eliminate any possible sagging of the bottom of the bag in extreme loading conditions, (we loaded them up ¾ full of bolts and washers! ), we installed a diagonal webbing that joins the upper back of the bag to the lower front. This allows for a perfect load transfer to the backplate and, through the attachment system, to the bike rack. The diagonal webbing is in fact not required in normal loading conditions and it can be unbuckled with the standard Duraflex buckle. 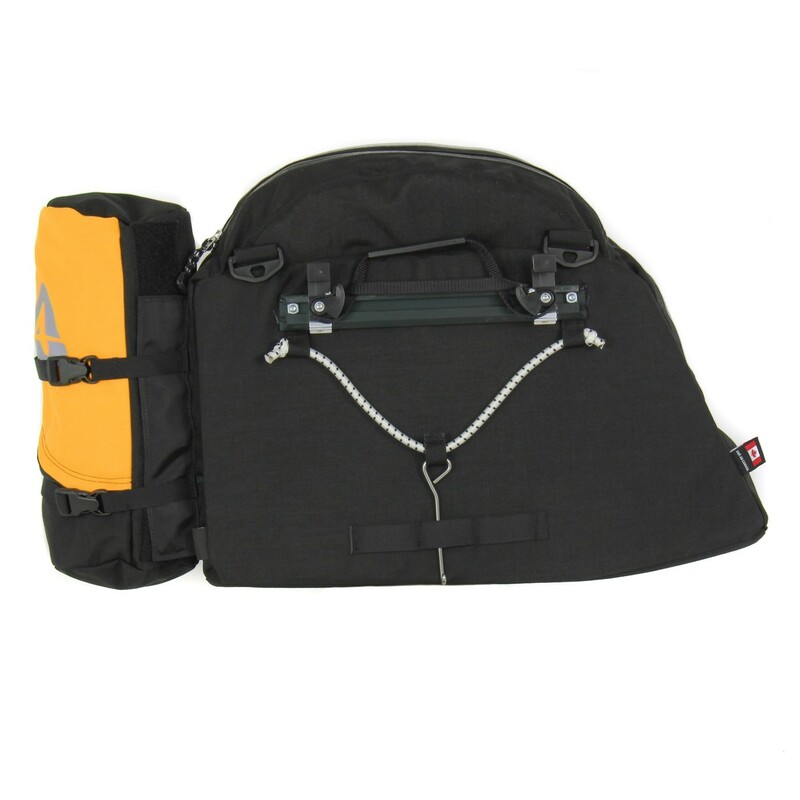 The webbing is also useful to stabilize and separate the content of the main compartment if you wish. Visibility is even more important on a "bent" than on an upright. So the bright yellow accent color (on top of the gorgeous look) will grab car drivers' attention in daylight while the ubiquitous reflective material on all sides of the bags will work wonders at night. There really are reflective strips and piping everywhere; even the zipper pull tabs and the loop on the front compression strap has some. If people don't see you, it's because they're looking the other way. A shoulder strap with that? How does the RT-60 fit on your recumbent? Here are pictures of the RT-60 on different recumbents. Please send us a picture of how they look on yours and we'll add it here for other people to see! I just bought my second pair of RT 60's because I lost one during a move. 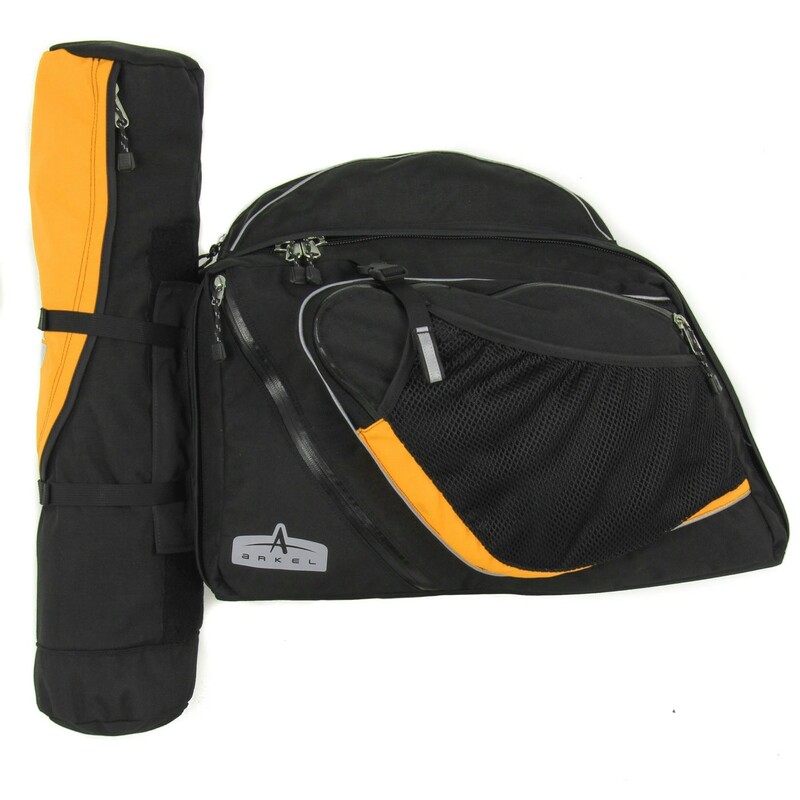 They are the finest recumbent bags on the market and do hold up to abuse. They are expedition grade so they are heavy, even empty they add enough weight to trike to make lifting rear and walking trike more of a chore. Fill them up and you must be strong to lift them. Carried as luggage they work well with one in each hand. Empty they fold flat enough for easy one handed carry. I was not happy with the fit of rain covers and they did not last long on harsh 4 month expeditions. I keep stuff dry with zip lock and dry bags inside. I put very heavy loads in these with no problems. A hobo with camera and guitar I have traveled all over the United States. They do drag on Bob Nutz if you use that style trailer and will wear hole in fabric. I had a saddle shop fasten leather over wear spot and problem is solved. If you want to live on a trike these are the bags for you. I do want to find a short rear tube for the back as I do not like the long tube sticking up and below my load. I have one hole in front of bag from a rodent who coveted fruit I left inside overnight. Learn. 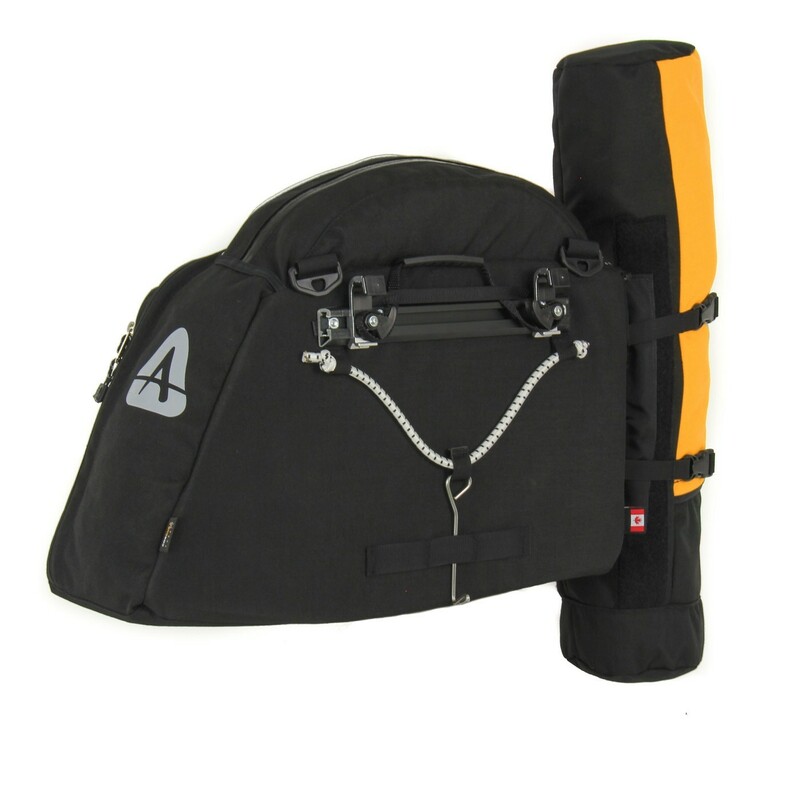 I've used these panniers for many 3 to 5 day self-supported tours on my ICE Adventure recumbent trike. They fit great and I've had no issues with them rubbing on the 20" wheels, stays, etc. 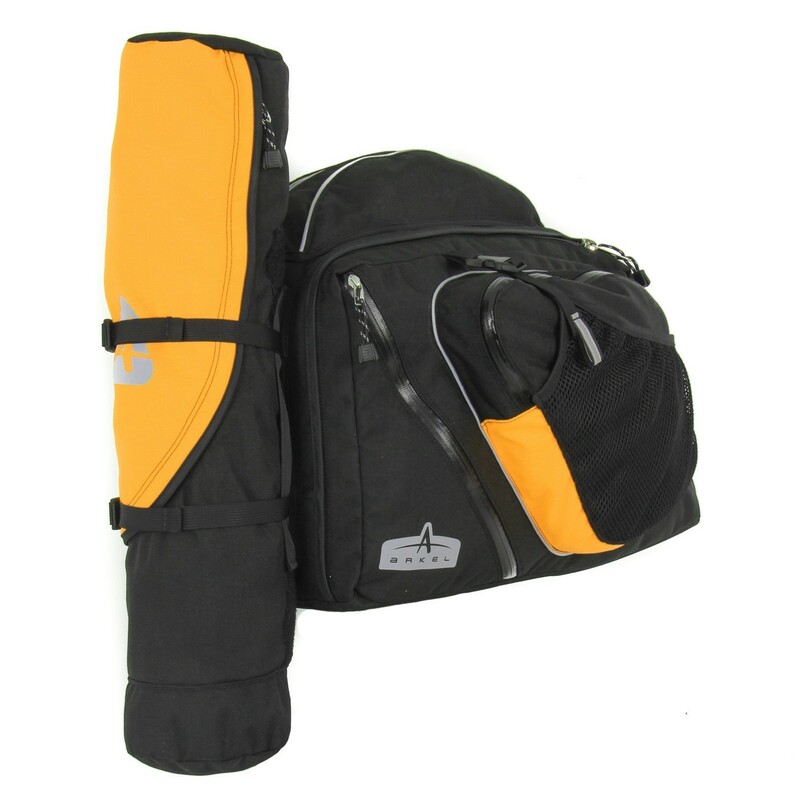 I use the external tube pockets to carry a portable camp chair and my cook kit and fuel. I'm a hammock camper and therefore don't carry a tent but the tube pockets would work well for tent poles. The panniers are not waterproof (and don't claim to be), so I pack my stuff in oversized ziplock bags which work fine. I've had these now for about 5 years and they show little wear and have held up great. 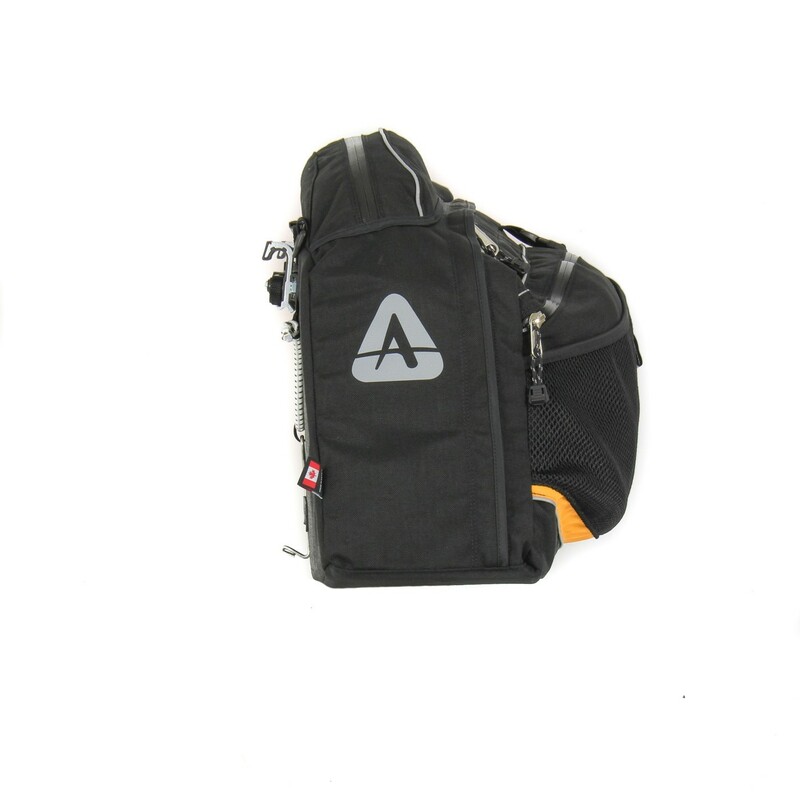 I also use Arkel's trunk bag and two small handlebar bags when doing these self-supported tours. Great products and though spendy, a great value. I bought a set of these bags to use on LWB recumbent (Lightfoot Ranger). Unfortunately due to the rear bike seat stays interfering I couldn't get the bags to fit on the rack. I also found that the "tent" bag tube pocket on one bag can not contain either my one person, or 2 person tents with poles included. I must pack the poles separately and even than it is very difficult getting the tent into the bag. I did return the bags and used the slightly smaller under seat Arkel versions instead though they need additional strapping to support them. Rain covers are essential for these bags. I have had a set of these RT60s for my green speed trike for over 10 years. Used for both touring and commuting. After nearly 10K miles of use they are still going strong. The fabric has held up great, shape is surprisingly well preserved, despite lots of heavy groceries. The attachment mechanism has always worked well. These are expensive but only if you don't use them. If you consider how long they last, you'll end up replacing another brand several times during the service life of these. Highest recommendation.